Archaeologists discovered the remains during an excavation in Nanchang city. ARCHAEOLOGISTS HAVE discovered mummified human remains in a royal tomb belonging to the Ming dynasty. The well-preserved body of a man was found during excavations of the site in Nanchang city in Jiangxi Province earlier this week. He is believed to be a royal descendant. The Ming Dynasty ruled from 1368 to 1644 and had its capital in Beijing. The dynasty was the last ruled by ethnic Han Chinese and was replaced by the Shun Dynasty after the fall of Beijing during a rebellion. During its rule, the Ming Dynasty oversaw the construction of part of the Great Wall. 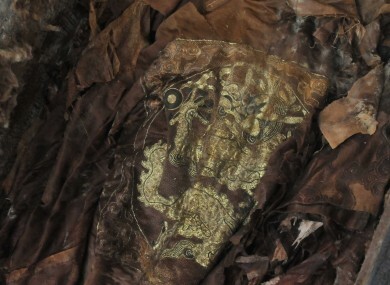 Email “In pictures: Mummified human remains found in Ming Dynasty tomb”. Feedback on “In pictures: Mummified human remains found in Ming Dynasty tomb”.